That the foreign policies of various governments often appear to be confusing or contradictory is because they frequently are. During Barack Obama’s presidency, such inconsistency has seemed to characterize aspects of America’s relations with the six Gulf Cooperation Council (GCC) countries – Bahrain, Kuwait, Oman, Qatar, Saudi Arabia, and the United Arab Emirates. The ambiguity and uncertainty that accompanies it is among the things that Obama has sought to dispel and clarify in the course successively of his March 2014 visit to Saudi Arabia, his May 2015 summit at Camp David with senior leaders of all six GCC countries, and his mid-April 2016 attendance at a similar meeting with leaders of the same countries. As this essay seeks to demonstrate, what he has had to contend with – and what others of late have had to contend with regarding aspects of his administration — in terms of background, context, and perspective has not been easy of resolution, amelioration, or even abatement. Dating from before and since these high-level GCC-U.S. meetings, Washington has taken steps to strengthen and extend America’s overall position and influence in the GCC region. A principal means for doing so has been through the GCC-U.S. Strategic Dialogue. But one example among several was when former Defense Secretary Chuck Hagel, along with Secretary of State John Kerry, came with approvals for billions of dollars in sales of U.S.-manufactured defense and security structures, systems, technology, and arms to GCC countries, together with long-term munitions and maintenance contracts. President Barack Obama attends a U.S.-GCC summit in Riyadh, Saudi Arabia, in April 2016. Photo: Saudi Press Agency. Yet, simultaneously, signals from Washington and the mainstream U.S. media before and since Obama’s meetings with his GCC counterparts have not always been as clear as the signalers thought would or should be the case. That said, what specialists have had no doubt about for some time is that the Obama administration is recalibrating the strategic focus of its international priorities in hopes of being able to accomplish two objectives at the same time. One objective has been, and continues to be, a steadfast resolve to remain committed to the security, stability, and prospects for prosperity in the GCC region. The other has been and remains a parallel determination to emphasize the Asia-Pacific regions. Affecting the need for such a recalibration have been major U.S. budget reductions and their impact on strategic concepts, forces, and operational dynamics. At issue and under examination in this regard, according to the Secretary of Defense in advance of the most recent Quadrennial Defense Review (QDR), are, and for the foreseeable future will continue to be, America’s assumptions, ambitions, and abilities. Understandably, the GCC region’s reaction to these trends and indications was and continues to be mixed. High level delegates from about twenty countries will meet in the Bahraini capital Manama on December 5-7. They will convene to debate regional realities of defense and security. Among the unwelcome developments since last year’s gathering have been Israel’s heightened provocation, oppression, dis-possession, and ongoing denial of the rights of Palestinian Arab Christians and Muslims among its citizens and those under its continuing illegal occupation. 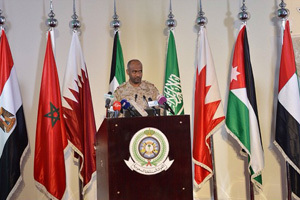 The participants are also faced with the further rise and sweep of the Islamic State in Iraq and Syria (ISIS); the Houthi advances in Yemen to the capital in Sanaa and beyond to the Red Sea and Hudeidah, the country’s second largest port; and the problematic and yet-again-extended negotiations over Iran’s nuclear program. F-16 Desert Falcons from the UAE Air Force lined up during joint training with the U.S. in 2011. Photo: U.S. Air Force. Few intelligence analysts and political and security watchers predicted that an extremist Islamist faction in Syria’s civil war would sweep with such force through northern Iraq, threaten Baghdad, and inch its way through the country’s western Anbar Province to within range of Saudi Arabia’s borders. Indeed, the confused and confusing battlefield in Syria has again proven that it can spawn the kinds of circumstances, events, and players that at once threaten to destabilize the Levant and pose what, a year ago, were then unforeseen challenges to the Arabian Peninsula and Gulf regions. Just as dangerous in the rise and advance of ISIS has become the lure, to many recruits to its ranks, of its millennial ideology and its promise to establish an unsullied Islamic Caliphate that would redress Muslim grievances. One of the most difficult issues confronting the Manama Dialogue participants is how to address the multifaceted causative underpinnings of the threat that ISIS poses to regional stability and peace. Having the necessary military means to protect against real and imagined threats is one thing. Being able to mobilize, deploy, and effectively implement such means is another. Of the two, the latter is vexing as it is pinned to the hope of containing and countering, if not delivering a mighty body blow, to regional radicalism and violent extremism that would discredit and severely weaken the appeal of such phenomena for far into the future. That a small militant faction like ISIS, which was originally armed with only the most rudimentary weapons it had collected on the Syrian battlefield, was able to roll over a well-armed Iraqi army proved two interrelated facts that contained important lessons. All is not well in Arabia and the Gulf. The further unraveling of security and stability in Iraq has exemplified this and more to the increasingly beleaguered government of Iraqi Arab Prime Minister Nuri al-Maliki in Baghdad, the country’s capital. 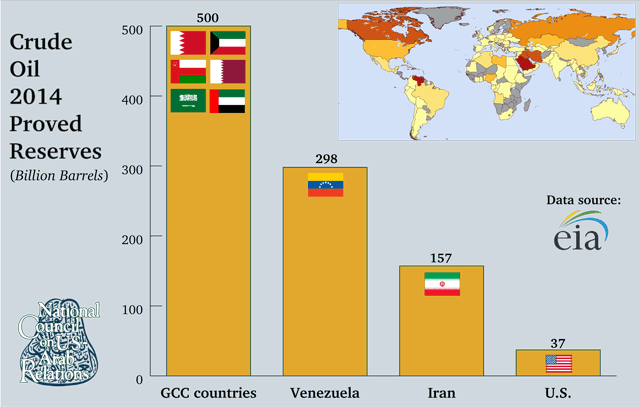 The accelerated breakdown of law and order in the land between the rivers has also rattled the governments and political dynamics of Iran, Syria, Turkey, Jordan, Yemen, and the six member-countries of the Gulf Cooperation Council (GCC) – Bahrain, Kuwait, Oman, Qatar, Saudi Arabia, and the United Arab Emirates. Among these countries, Saudi Arabia and Iran are of out-sized importance. Greater information, insight, and knowledge about how these two competitors for regional prominence perceive, interact with, and analyze and assess the likely intentions of the other – not just regarding Iraq but also Bahrain, Yemen, Syria, and Lebanon – is essential to understanding key trends and indications in Arabia and the Gulf at the present time and where the region is likely to be headed in the days to come. It is in this context that the National Council on U.S.-Arab Relations is privileged to present the essay that follows by National Council Distinguished International Affairs Fellow Dr. Imad Kamel Harb. Dr. Harb recently returned to Washington, DC after spending the previous seven years working as a researcher and analyst in the GCC region. Dr. Harb previously worked to help rehabilitate the Iraqi higher education sector as a Senior Program Officer for Education at the United States Institute of Peace (USIP). There he authored a USIP Special Report on “Higher Education and the Future of Iraq,” published in 2008. Since earning his PhD from the University of Utah, Dr. Harb has been an Adjunct Professor at San Francisco State University, the University of Utah, Georgetown University, George Washington University, the University of Maryland, and the Middle East Institute. Recent diplomatic overtures emanating from Saudi Arabia about possibilities for a thawing of relations with the Islamic Republic of Iran are unlikely to produce their desired results. Saudi Foreign Minister, Prince Saud al-Faisal’s recent invitation to his Iranian counterpart, Mohammad Javad Zarif, to visit the kingdom was tepidly received at the Iranian Foreign Ministry. A potential visit by the former Iranian President, and former Chairman of the Assembly of Experts, Ayatullah Ali Akbar Hashemi Rafsanjani, itself originating from an invitation by the new Saudi Ambassador to Tehran, Abdul-Rahman bin Ghorman, still awaits the approval of the Supreme Leader of the Islamic Revolution, Ayatullah Ali Khamenei. Myriad contentious issues from Bahrain to Yemen to Iraq, and from Lebanon to Syria have had the two countries’ leaderships at loggerheads and made anentente improbable. 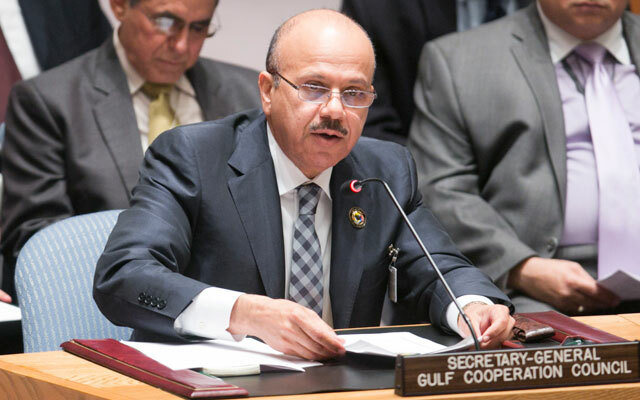 Indeed, Iranian-Arab acrimony promises to be the state of affairs for the foreseeable future, negatively affecting regional peace and inter-communal relations between the Gulf’s Sunni and Shiite Muslims. 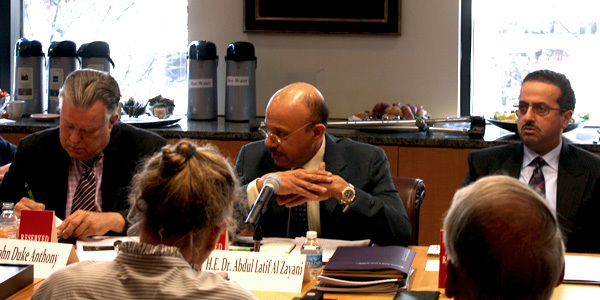 Audio recordings of National Council on U.S.-Arab Relations’ Public Affairs Briefings held during the spring and summer of 2013 are available for streaming and downloading. Listen to and download each program through the links below, or visit the National Council’s podcast feed through iTunes to access recordings from Council programs. On May 21, 2013, the National Council on U.S.-Arab Relations and the U.S.-GCC Corporate Cooperation Committee hosted “Bahrain: A Conversation About Its Challenges and Opportunities” featuring Ambassador Ronald E. Neumann, President, American Academy of Diplomacy and former U.S. Ambassador to Bahrain, Afghanistan, and Algeria; Professor David Des Roches, Senior Military Fellow, Near East South Asia Center for Strategic Studies, National Defense University; Ms. Sarah Leah Whitson, Executive Director, Middle East and North Africa Division, Human Rights Watch; and Professor Paul Sullivan, Professor of Economics, National Defense University and Adjunct Professor, Georgetown University. 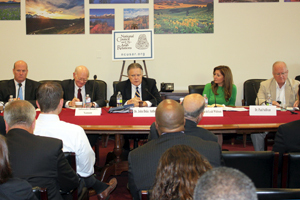 Dr. John Duke Anthony, Founding President & CEO, National Council on U.S.-Arab Relations, served as moderator. Links to a podcast and video recording of the program are available below. The podcast, along with recordings of other National Council programs, is also available through iTunes: http://bit.ly/itunes-ncusar.